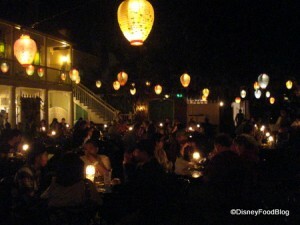 Tucked into a spirited corner of Disneyland’s New Orleans Square is the famed Blue Bayou Restaurant. Soft twinkling lights & candlelit tables, a sizeable & hearty menu, and an environment that succeeds in transforming guests right into a creole dream awaits hungry folks. There is not a bad seat in the house; some tables sit under the canopy of moss-laden trees, some overlook the swampy banks of the famous “Pirates of the Caribbean” attraction, and most sit under the glow of painted paper lanterns. Many aficionados believe that a trip to Disneyland is not complete without a meal at the Blue Bayou! Make sure to try the Monte Cristo sandwich (currently only served during lunch hours) and the Royal Street Seafood Jambalaya. This is a very popular dining location and advanced reservations are suggested.